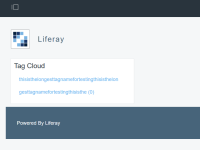 Tags with very long names extend over Tag Cloud portlet borderTags with very long names extend over Tag Cloud portlet border. Create a new tag with a relatively long name (i.e. 'thisisthelongesttagnamefortesting'). Tag at least 10 assets with the tag. Add a Tag Cloud portlet to a page with the 30/70 page layout in the 30 column.